Breakfast is the most important meal of the day. While your regular cereal contains some of the nutrients that you need, there is still a better option. Introducing Orgran Quinoa Puffs. Made with whole grains and 8.7% Quinoa protein rich legume for sustained fullness, this will be the perfect meal to start your day. 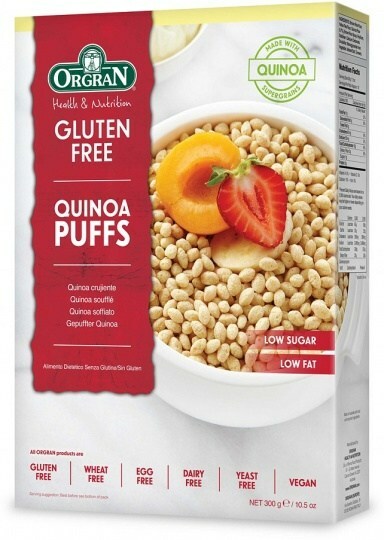 If you are on a special diet, you may find that Orgran Quinoa Puffs is a fantastic choice for you. It is gluten, wheat, dairy, egg, yeast, and GMO FREE. What is more amazing is that it is 100% Vegan! Orgran Quinoa Puffs is the perfect start to the morning for you and your family. Ingredients: Brown Rice Flour, Yellow Pea Flour, Quinoa Flour (8.7%), Brown Rice Syrup, Psyllium, Stabiliser: Calcium Carbonate. Emulsifier: Monoglyceride from Vegetable. Iodised Salt, Turmeric.